Right handed pitcher Ryan Thompson has a future that is much brighter than those rare summer days in Fort McMurray. Originally from Calgary, he played ball in Fort McMurray before moving to New Hampshire and playing High School baseball at Souhegan High in Amherst. He then started his College career at UConn with mixed success. His highlight was pitching a perfect inning of relief in a win at Hartford, but he ended up only appearing in 5 games, and had a 9.53 ERA. 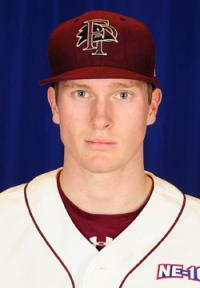 Subsequently he transferred to Franklin Pierce to play for the Ravens of the Northeast-10 Conference in Rindge, NH. Things have been looking up ever since! As a newcomer and just a sophomore, he was designated one of the team’s captains which was “a testament to his leadership qualities”, said Ravens Coach Jayson King, adding that Ryan “ is one of the hardest working guys on our team and is totally dedicated to pitching and our program”. And the accolades kept coming. In the fall he was named as a “Newcomer to Watch” by the American Baseball Coaches Association in Collegiate Baseball Newspaper. Earlier this year, he was also named as the #24 prospect in the “Perfect Game USA” list of small college top 100 prospects. He is currently on the Canadian Baseball Network’s draft list as one of the top prospects, projected to be #8 among Canadians. On the mound, Thompson started out by winning a game against a team of Orioles academy prospects in an exhibition trip to the Dominican Republic. He pitched 6 shutout innings while allowing only 2 hits and striking out 5. Since then, in games against other Colleges he has a 6-0 record, and has struck out 60 batters in 42 innings, while compiling a miniscule 0.43 ERA. In 4 of his 6 starts he has not given up an earned run while pitching at least 7 innings. In his latest outing, he scattered 3 hits over 8 innings while striking out 10, giving Southern Connecticut State (22-1), its only loss of the season, 3-1. After the season ends, he plans on playing for the Swamp Bats in Keene, NH of the New England Collegiate Baseball League in the summer. He has come a long way from the sandlots of Fort Mac, where he played more than 1,700 km from the nearest MLB team, with kids who were more inclined to play hockey. He credits Reggie Rivard, another Canadian pitcher from Alberta, for drumming up interest in baseball among these young players. After playing for the Rangers and Brewers system up to AAA, Rivard has spent the last few years pitching in Alberta for the Edmonton Cracker-Cats and Calgary Vipers, while spending the offseason in Fort McMurray running winter baseball camps for the local players. 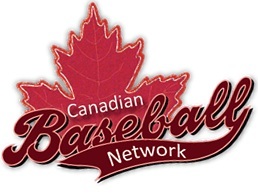 Thompson said that seeing the enthusiasm and development of these players gave him reason to believe that people in Canada really do love their baseball. As a Canadian, Ryan Thompson is a big fan of Matt Stairs, who “rejuvenated his career as one of the best pinch hitters in the game” said Thompson. He is also a big follower of long-time Blue Jay, Roy Halladay, a fellow RHP. “I admire him for his unmatched work ethic and willingness to out prepare his opponents”, he added. As far as he has come, he has dreamed of being in the majors since he started playing Little League, and knows he still has a long way to go. An avid Blue Jays fan, if Thompson keeps pitching like he has, the day he’s pitching for the home team at Rogers Centre, like his idol Halladay did, may come sooner than anyone imagines.